Ask about specific home care treatments to enhance your results. An organic facial treatment to caress your skin with vitamin rich nutrition using the highest quality ingredients. we can address a variety of skin concerns such as premature aging, acne, loss of vitality , tone and radiance. As we age our skin begins to lose its firmness, facial lines around the eyes, mouth and forehead become deep and the skin around the neck loses its elasticity, This treatment will help to fight premature aging, wrinkles and slackening of the skin. 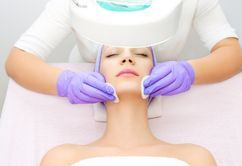 Our exclusive facial will help normalize and balance facial disorders. it will assist in the loosening of blackheads and help to discharge excess toxins from the skin. combined with a strict and consistent home skin regime as prescribed by your skin care professional, your skin will become balanced with lasting improvement.